and see another link posted from Steven Puziak on January 17, 2005, below. The Virtual Memorial also includes photographs of many soldiers. TIMOTHY JOSEPH TIERNEY – son of Timothy Tierney and Catherine Houlahan. THOMAS PERCY TIERNEY – son of William Tierney and Elizabeth Power. and Ellen Waters. Thomas Percy was 1st cousin to Timothy Joseph Tierney above. 1105227. He was 20 years and 8 months old at the time of enlisting. was BROWN. He had 20 / 20 vision. He returned from War. (see posting dated December 29, 2007). JOHN EMMETT HOULAHAN – son of Thomas Houlahan and Margaret Gleeson. of the Eastern Ontario Regiment. His regimental numbers were 3325690.
eyes were GREY and his hair was BROWN. There were no distinguishing marks. JOSEPH LEO HOULAHAN – son of George Houlahan and Mary Ann Lynch. 1st cousin to both Mathew Austin and John Emmett Houlahan. under the Military Service Act of 1917 on October 30th, 1918 in Toronto. was placed with the 1st Depot Battalion of the Central Ontario Regiment. His regimental numbers were 3031871.He was born in Jockvale returned from the War. MATHEW AUSTIN HOULAHAN – son of Thomas Houlahan and Margaret Gleeson. Regiment Depot Battalion of B.C. His regimental numbers were 2020563. 1918, killed in action. He was John Emmett’s brother. GEORGE LEO HOULAHAN – son of James Houlahan and Jane Anne Hawley. 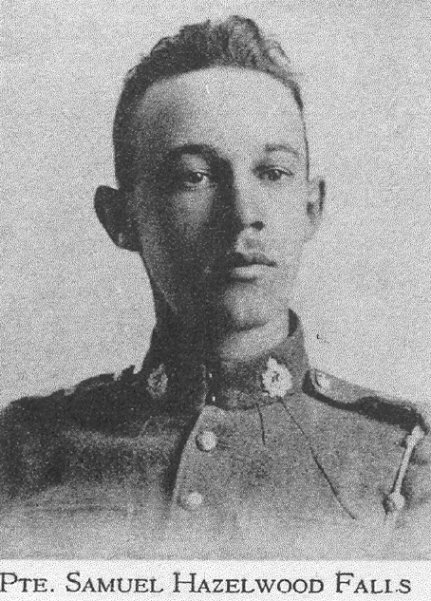 He was placed with the 2nd Depot Battalion of the Eastern Ontario Regiment. Honorah Helena Houlahan who died 9 months after birth from convulsions for 2 days. was BROWN. He also had a small mole on the left shoulder blade. He returned from War. and was drafted on June 11th, 1918 under the Military Service Act of 1917. His regimental numbers were 3322618. He was the brother to William Francis. hair. He was a returned man from the War. 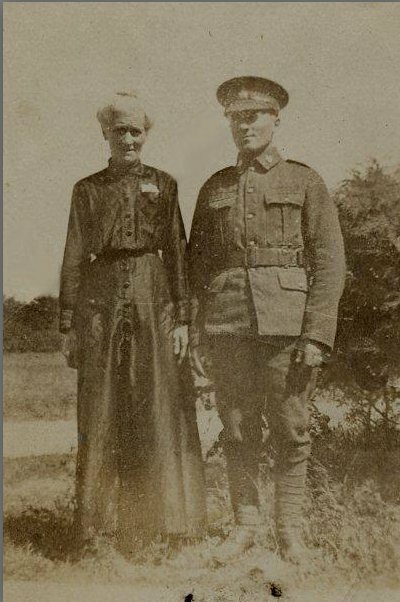 Here are some of my German Canadian relatives from Ottawa who fought for Canada in WW I.
served 10 years in G.G.F.G. CYRIL GODFREY PINHEY – son of Godfrey Greene Pinhey and Anna Verona James. were 226636. Cyril was 19 years old at the time. Cyril joined on November 4th, 1915 and was a returned soldier. HENRY FRANKEL PINHEY – son of of Godfrey Greene Pinhey and Anna Verona James. Great grandson of the Hon. Hamnett Kirkes Pinhey and Mary Ann ??. Force in Ottawa. His regimental numbers were 342908.
soldier. He was also Cyril’s brother. Great grand daughter of the Hon. Hamnett Kirkes Pinhey and Mary Ann ??. She was 1st cousins to Cyril Godfrey and Henry Frankel. April 29, 1891 in March Township. He was 24 years at the time of enlisting. Henry Frankel Pinhey. His rank was Sergeant. in action on September 27, 1918 and is buried in France. a local painter in Ottawa. Sadly Fred was killed in action but Ernest returned. Noffkee, Schroder, Winges, Shandler, Graham, Marts and other Romhilds (cousins). Ottawa, Carleton with his family with the surname of Rhomeld per transcription. allowance. Fred was listed missing following action on September 17th, 1916. BWM medals after however no family history of any medals received. ROMHILD - Ernest Charles was born on 29 April 1889 in Ottawa East, Ontario, Canada. child  Charles born in May 1915. Ernie attested for WW1 on November 27, 1915.
village of Romhild, Thurningen, Germany but was unable to detour and visit. at two o'clock Tuesday Afternoon. Interment to be made in Beechwood Cemetery. interest. As Marlene will know, Fred joined the 59th Battalion and Ernie the 77th. additional training after his arrival. members of the local militia,  the 43rd (Duke of Cornwall's Own Rifles) regiment. main body followed in June of 1916.
who enlisted in them actually served is to obtain his service records from LAC. From the information  posted it seems clear this is what Marlene has done. First World War enlistment papers  shown in Taylor's post. of individual photos of Ottawa men who served and usually includes a brief bio. after their death, many are now available through the Paper of Record website. http://www.cefresearch.com/matrix/index.html   The CEFSG Matrix Project. operations. Contains a wide range of useful information. loosely defined and I have found  men and women from both Ottawa and Hull listed there. of a blog in his time off. of the site is to create an entry for every member of the CEF during WW1. daughter of Louis Cayis and Elizabeth Shannon, were married 13 Nov 1889 in Fallowfield. Both William and Elizabeth say they were born in Jockvale. married in South Gloucester on 2 June 1896. Included in the photo above is George B. Ryan of Riceville, Ontario. Many of the men brought their own horses with them to training camp at Petawawa. I have not recorded much detail;  just their service number, name, connection to Ottawa. 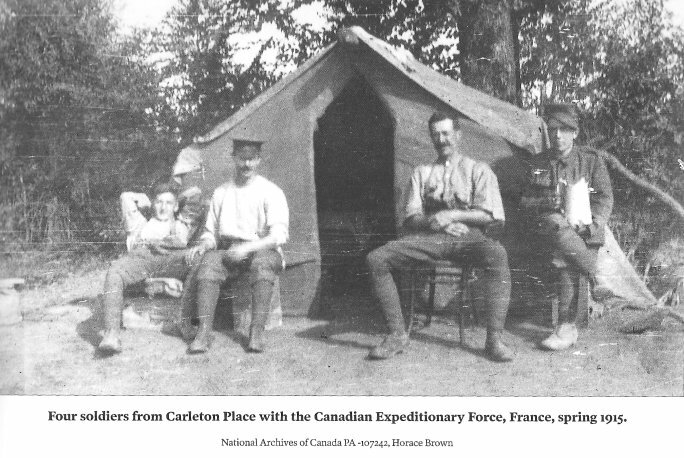 online in Library and Archives Canada's Soldiers of the First World War database. other bits of info I found interesting. 814635 Pinnault, Joseph (born at Rimouski Que) t Died Aug 9 1918 4th Bn. Italy in 1945 by co-incidence. of the Rideau Canal which was completed in 1832. 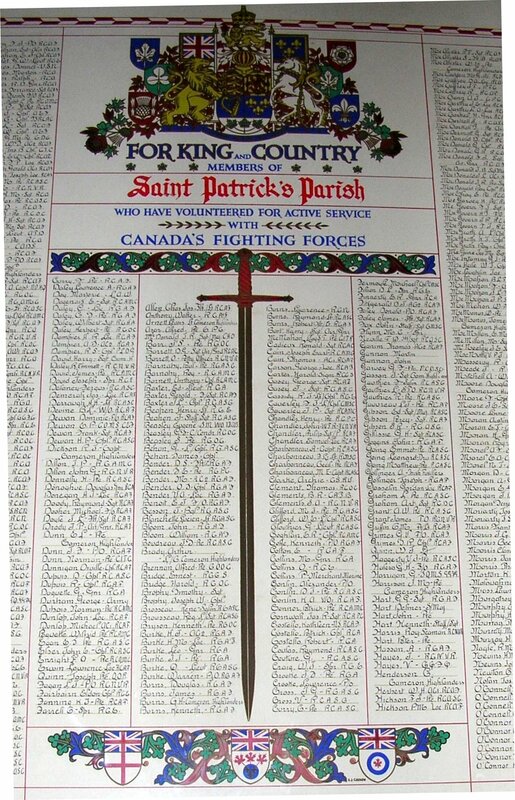 Excellent photo of the Commemoration list from St.Patrick's Basilica in Ottawa. My first cousin (once removed), Kenneth Colfe is listed upon it. Kenneth was the son of Henry and Estella Colfe of Ottawa. dead and is buried in the Wedde (Blijham) churchyard in the Netherlands. of a very strong, hard-working and talented generation ! And another thing. They had respect for themselves, their jobs and their colleagues. a week plus Saturday mornings. And they knew how to have fun. Canada. They are relying on voluntary contributions by the public of pictures and information. now the intersection of Century Road and Third Line Road (in North Gower Township, I believe). who served in WW1 with a cross beside those 31 parishioners who died during this war. churches ( St. Patrick's, St. Philip's etc) was done by A J Cusson one of the Group of Seven. and friends to come forward with information and photos to add to the collection. In respect to WW11, we are still looking for information related to William Francis Hull. Can anyone verify the names of the four men? Kenneth Henderson from the Gracefield, Quebec, area, served in the Canadian Forestry Corps during the Second World War. There are two photos and a cemetery record for him on our St. James Anglican Cemetery page. to serve overseas during WW1 and WW2. Many Ottawa and Gatineau area persons enlisted into the Canadian Forestry Corps. Veterans Affairs has changed all the url's on their Canadian Virtual War Memorial -- very inconvenient if you have linked to any of them. fallen family member(s) or the links to hundreds of online memorials created by local history societies, legions, churchs and schools. Will Dunlop has written a summary for Private Moses Kealey who served Overseas with the Canadian Expeditionary Force in WW1. Franklin Clarke of Fitzroy Harbour. I’ve been going over early 1900’s Carp Reviews through Google News and came across this exciting letter! Carleton County. He was killed in France, Hill 70. He is pictured with his mother, Jennie. Samuel Hazelwood Falls did not die in the war but was none the less a casualty of it. He committed suicide at the age of 33. He was the son of William Falls & Harriet Rankin. Please include these pictures if they are of any interest. Mr. David A. Smith has contributed a new web page about local firefighters who served in England during the blitz in WW2. my uncle Gerald Dunlop and my recently deceased father, John Dunlop. Lest we Forget.